If you’re seeing the telltale signs of hair loss—more hairs in the drain, in your brush, on your pillow; a creeping hairline; more scalp showing through—the time to act is now. The longer you wait, the more hair you’ll lose … and the harder it will to get back that youthful, full head of hair you always treasured. But before you reach for harmful and temporary fixes like prescription drugs, talk to us. Our experts can help you keep the hair you have and even restore the hair you’ve lost with safe, cutting-edge treatments like platelet-rich plasma (PRP) therapy, hair transplants, beard restoration, and scar revision. All without the risks and side effects of chemical-based hair loss drugs and shampoos. If you want to keep the hair you have, and even get back what you’ve lost, we can help. Contact us today. A Follicular Unit Transplant (FUT) is a safe and super-effective transplantation procedure that gives you amazing, natural-looking results you’ll love. This is how it works. While you’re under local anesthesia, one of our expert hair restoration surgeons takes a thin strip of hair from the back of your scalp. Individual follicular units from this hair then get transplanted into tiny round incisions in the area to be treated. In total, for a full head of hair, the surgeon may transplant something like 2,000 follicles, and it can take several hours—but you get to relax, chat, or watch TV while it’s going on. Did you know, you can also have your beard and even your eyebrows restored too? Beard and eyebrow hairs are mainly single-hair follicular units, unlike scalp hair, so the donor hairs have to be transplanted singly—but it’s basically the same procedure. 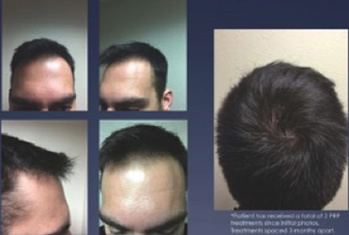 If you opt for a transplant using Follicular Unit Extraction (FUE), the way the donor hair is taken from you scalp is different, but the implantation is the same as for FUT. 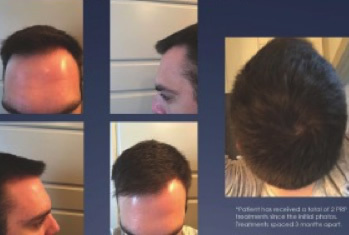 In FUE, individual follicular units are extracted one by one from the back of your scalp while you’re under local anaesthesia, using tiny round micro-punches. The slight downside of this option is that it takes longer than FUT, and only about 1,500 follicle units can be transplanted in a day—so you might need more than a day to finish the job. On the plus side, there’s no suturing to remove the donor hair. If you’re struggling with thinning hair, Platelet-Rich Plasma (PRP) therapy could be perfect for you. It’s an innovative new ‘stem cell like’ treatment that uses your own cells to regenerate your skin tissues safely and naturally. So how does this extraordinary therapy work? It’s so simple. First, our medical experts draw a tiny amount of your blood—and they run it through a dual-spin centrifuge process. Platelet-rich plasma separates out of the sample, containing high concentrations of regenerative cells and growth factors—all the good stuff! Our medical team then carefully reintroduces this powerful plasma back into the area you want to treat, where it goes to work right away, repairing damaged tissue and regenerating your youthful hair growth!